Zaiah Calvin became one of the top players in the state this year and led the Chargers to a national ranking and into the state tournament. She is our Star Times volleyball player of the year. Zaiah Calvin loves the highs and lows of volleyball – literally. 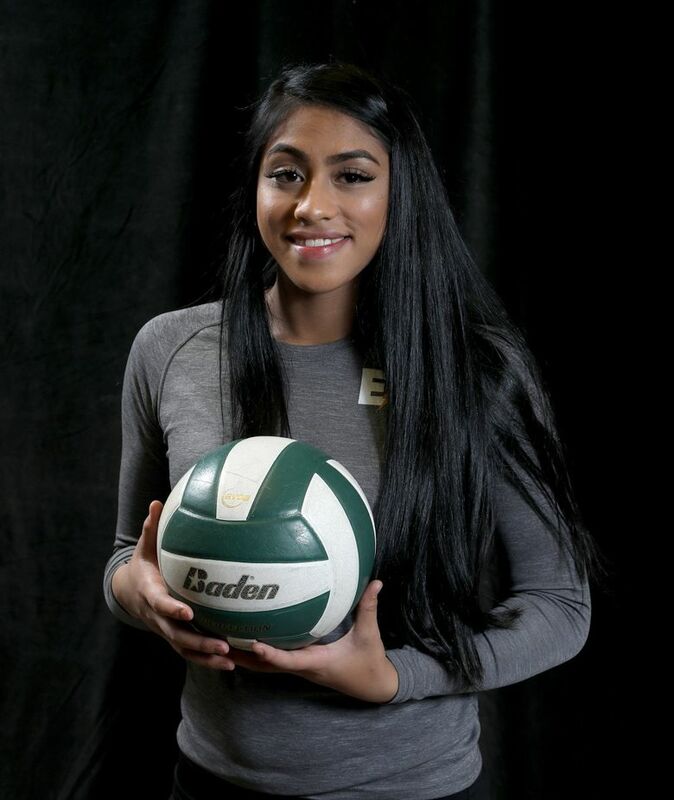 From skying to smack a stinging kill to diving for a point-saving dig, Calvin developed into a complete player for Kentridge High School over the past year. She led the nationally-ranked Chargers in kills (3.0 per set) and digs (2.0) as they reached the Class 4A state tournament for the first time since 2001, finishing third with a 25-1 record. For her performance and impact, Calvin is The Seattle Times’ Volleyball Player of the Year. “She is for real,” longtime Puyallup coach Tony Batinovich said after his team faced Calvin – the NPSL Cascade Division MVP – twice this season. Calvin, a senior still looking for the right college fit, is especially known for her leaping ability with a jump-reach close to 10 feet – particularly impressive since she admits she’s closer to 5-foot-7 than the 5-9 she’s listed at. Setter Austin Ibale has enjoyed feeding her the ball. “She’s definitely an aggressive hitter, and I’ve never really seen any other hitter hit the ball as hard as she does,” Ibale said. Hard and into the right holes. Calvin’s volleyball IQ pays off defensively, too. Calvin, who used to play soccer and basketball as well, said she chose volleyball in part because she loved watching her older step-sister dive on the court. Calvin, who enjoys drawing and can play the ukulele, started playing club volleyball in eighth grade but took major steps forward when she switched to the Puget Sound Volleyball Academy as a junior. “They (coaches) were on top of whatever I needed to work on – things I was doing well and things I could do better,” she said. Han noticed the improvements coming into her senior season. “She had a lot more opportunities this past offseason and really grew from it,” he said. One change came in her mental and emotional approaches to the sport – which can both delight and demean a player. And Zaiah Calvin went on the have a season to smile about. Ryan, the Metro League Mountain Division MVP, led the Lions to a second-place trophy at the Class 3A state tourney to cap an impressive career that also included first- and sixth-place finishes. The University of Chicago gets a player with a high skill set and strong leadership abilities. Kepley has been key to North Creek’s immediate success as just a second-year school. Intimidating at the net as a hitter and blocker, the Western Washington signee led the Jaguars to a share of the KingCo 4A championship, earning MVP honors, and a state-tournament berth. A force on the outside for the Vikings, Morin established herself as one of the top up-and-coming players in the state this season. She was instrumental in helping her team go 3-1 at the Class 4A state tournament and take home the seventh-place trophy. The 6-foot-1 Petersen, who signed with the University of Nevada-Reno, can throw a block party at the net with her near-perfect timing and instincts. She also hammers the volleyball consistently, and regularly posted double-digit kills for the Grizzlies. Martinka has been an impact player for the Spartans the past four seasons, keying three state appearances – including a strong showing at last weekend’s tournament that ended just one win shy of a trophy. She amassed more than 200 kills as a senior. Since the arrival of the dynamic Duckett as a freshman, the Roughriders have gone unbeaten in the Metro League Sound Division (she was MVP this season) and made three state appearances, capped by their first state trophy last weekend (seventh). A definite Division I prospect. Relentless in her pursuit of any potential dig, Kim has exceptional foot-speed and makes accurate reads. Her defense helped the young Jaguars (second-year program) win the KingCo 4A tournament and qualify for state. Headed to Gonzaga. Munoz made her final season at Monroe a memorable one to end her 11-year reign. She guided the Bearcats to the semifinals of the Class 4A state tournament, where they lost to eventual-champion West Valley of Yakima and wound up a school-best fourth place.